I was pleasantly surprised by the place I visited recently. Delhi Brasserie is based in the absolute heart of Soho but it could almost be a case of blink and you almost might miss it. Delhi Brasserie faces some stiff competition with so many restaurants nearby but I truly believe this place is a hidden gem and I will definitely be going back. Before my friend Urvashi and I had even stepped in to the restaurant we could smell the beautiful aromas and my friend and I knew we were going to be in for a treat. We were greeted by waiters who took our coats and showed us to a corner table. What I thought was really nice touch was at every table there was a bottle of Indian wine produced in the wine region of India, Nasik. 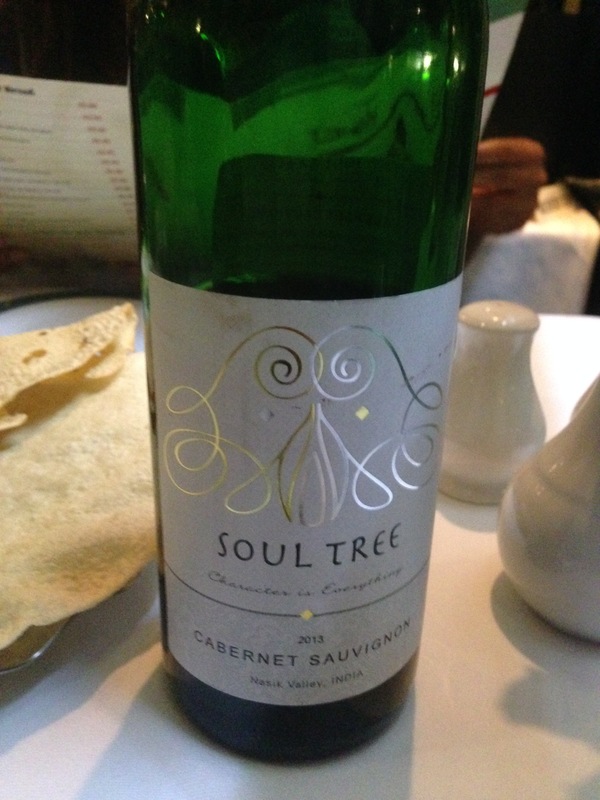 We decided to try the wine and it was delicious with rich spicy undertones and it complimented our Indian food completely. We started off with some poppadum’s which were a mix of the normal wafer like poppadum’s you get in Indian restaurants as well as the more traditional pappad style ones. This was served with 4 chutneys which were pickle, onions, yoghurt & mint and the most fruit, rich, thick mango chutney I’ve ever tasted! 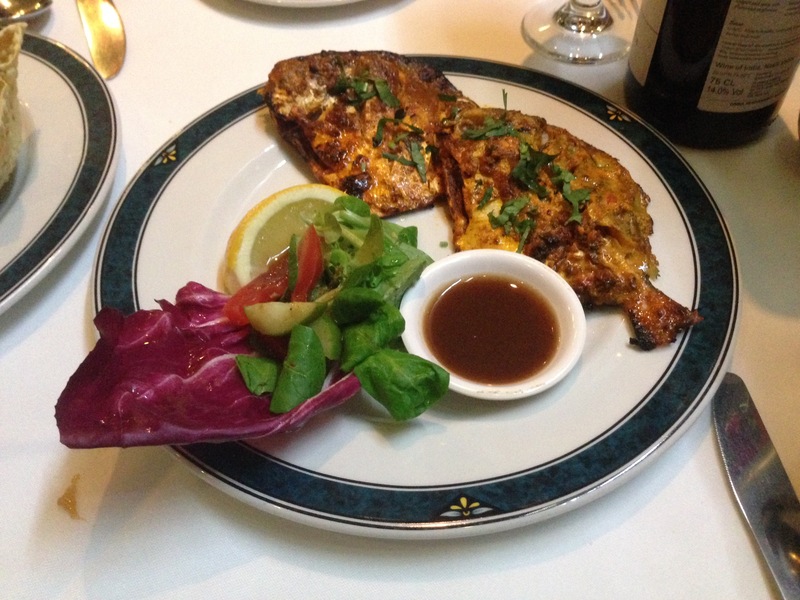 For starters we had the Crab Achari and Pomfret. Recently I have noticed crab appearing more and more in Indian restaurants and I love that because it is a really unique dish that is easily adapted to Indian dishes. The crab was spicy and tangy. 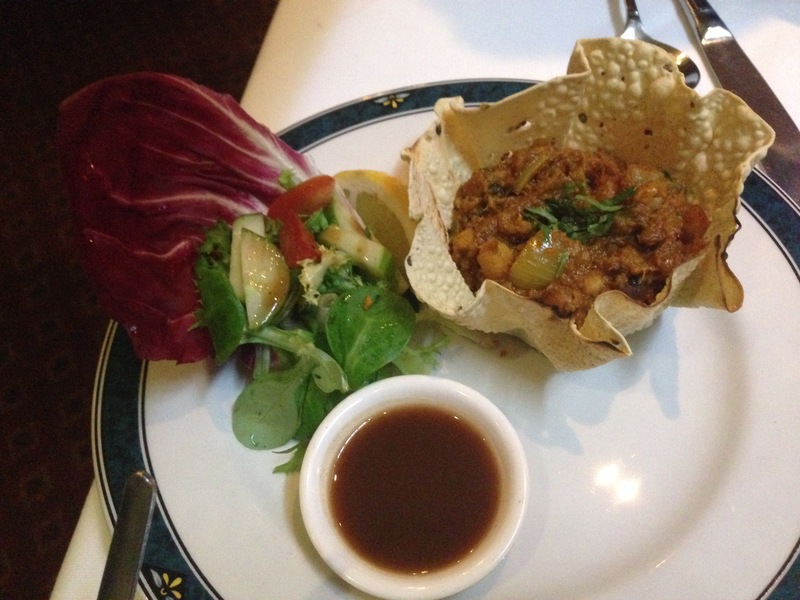 It was minced, marinated, cooked then served in a poppadum dish with salad. My guest had the Pomfret which was served whole and cooked like masala fish. It delicious, different, tangy and spicy. Some of the staff in the restaurant were Bengali so this was a great reflection of Bengali food coming through in the menu as well as North Indian dishes. What I love is when restaurants recommend their favourites. For mains they recommended the sukhi sabzi and aubergine dishes which were sooo delicious, proper home cooked style vegetarian dishes, they made us feel warm and fuzzy inside. 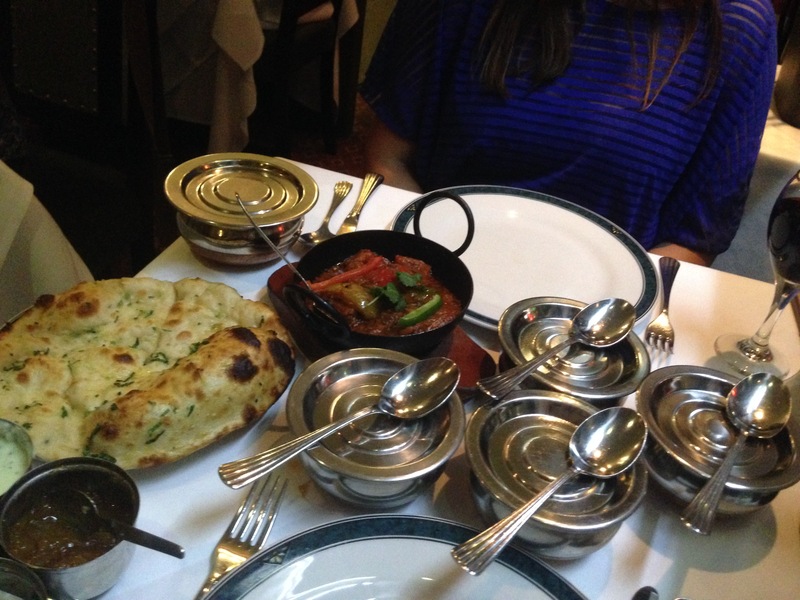 The chicken Jalfrezi and chicken Korai were spicy, tender, chunky and tantalising. The Paneer Makhni was slightly different to the one I would normally receive and it was a creamy, sweet n sour take one the normal makhni. 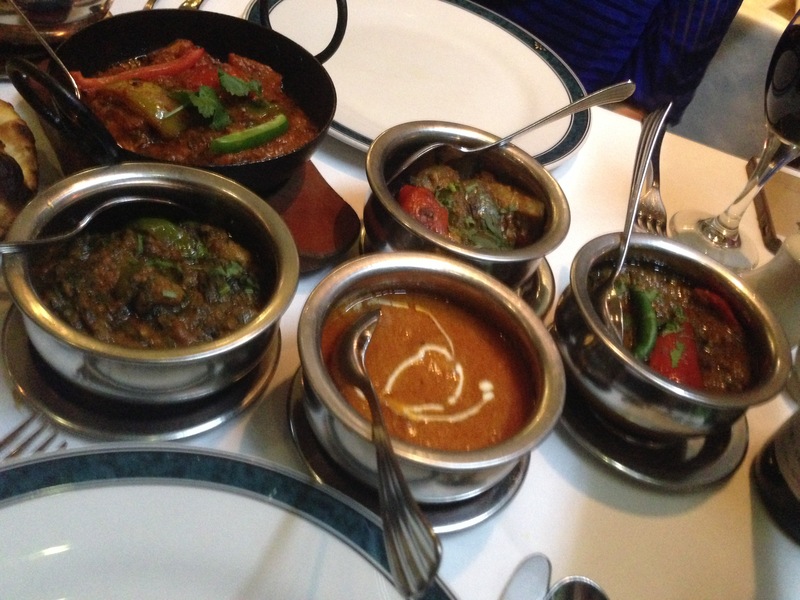 The lamb saag was again home-style but slightly salty for our tastes. The garlic naan was fresh and soft and they definitely hadn’t skimped on the garlic, it almost had a garlic dough ball texture and I loved that because i’m not usually a naan fan. 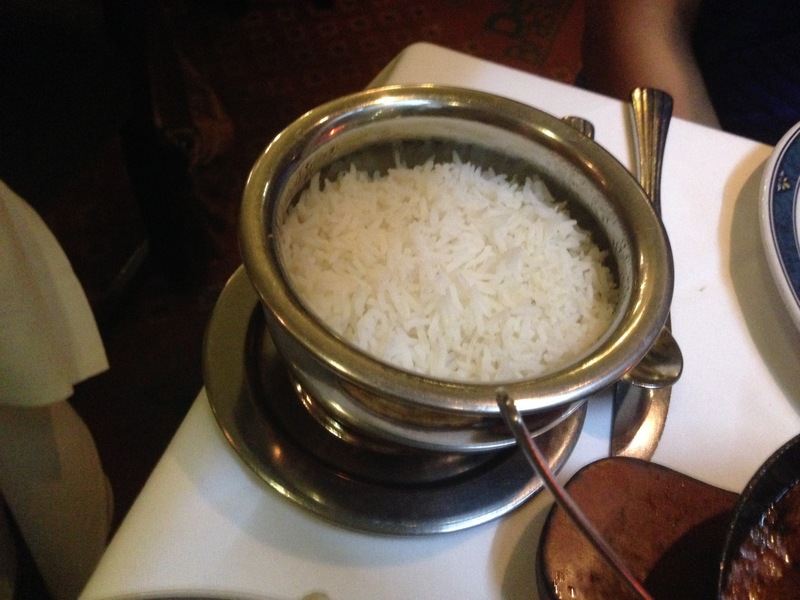 The rice was light and fluffy. Overall all the food was pretty delicious. Everything was served in large portions, it was home-style and comforting. The ambiance was great as it was busy and there seemed to be a lot of after work dinners and groups of friends having dinner, the restaurant had a Moroccan/Rajasthani theme with colourful mirrors and art. The service was friendly and attentive. And the fact that it is so central just makes it all perfect. Overall Delhi Brasserie is a great dining experience and especially for a nice after work meal and it comes highly recommended, especially for the fish. This was a really delicious meal out. I was definitely surprised by the pomfret … Something I’d never normally try, but would now have again. The jalfrezi was definitely a treat on the taste buds and I loved the way the rice was fluffy and didn’t stick together! Kudos to the chef. I’d say… Not a date place, but an evening out with a friend or 2 after work. Thumbs up from me… Thanks for a great meal.